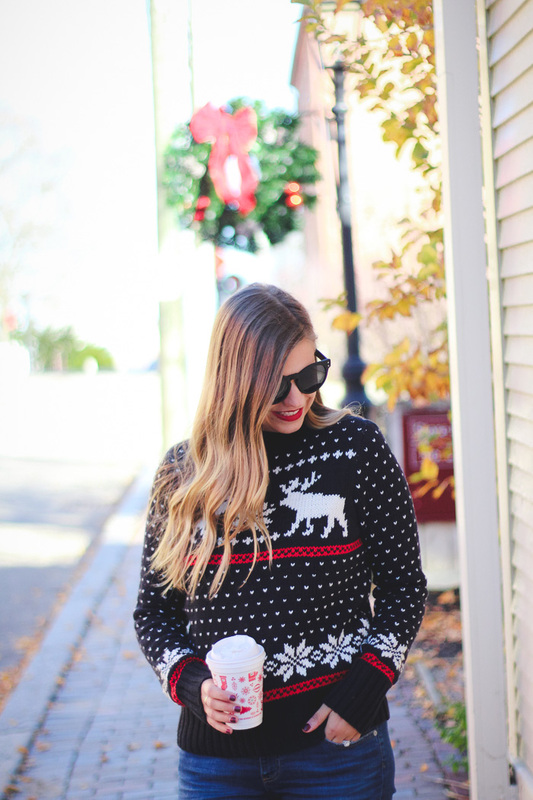 Style Cubby - Fashion and Lifestyle Blog Based in New England: The Perfect Christmas Sweater + Favorite Cyber Monday Sales! 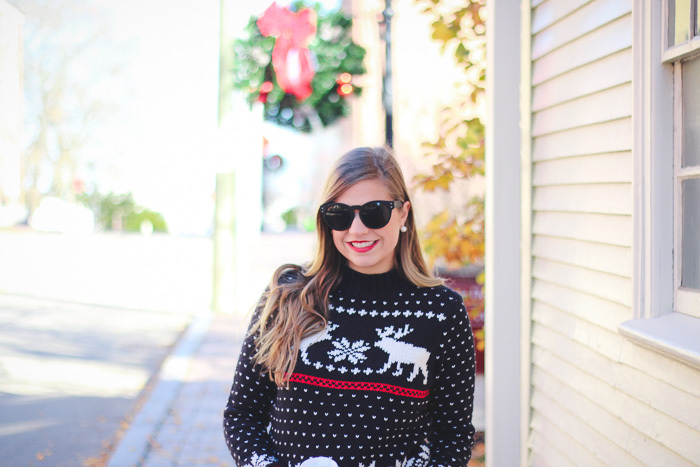 The Perfect Christmas Sweater + Favorite Cyber Monday Sales! Christmas Sweater 50% perfect off for cyber monday! / AG Jeans, Similar / Booties / Sunglasses / Earrings / Lipstick in "Cruella"
For the past few years, I've been on the hunt for the perfect Christmas sweater. I was looking for something that was knit, has winter images on it, looked vintage, and was cozy. 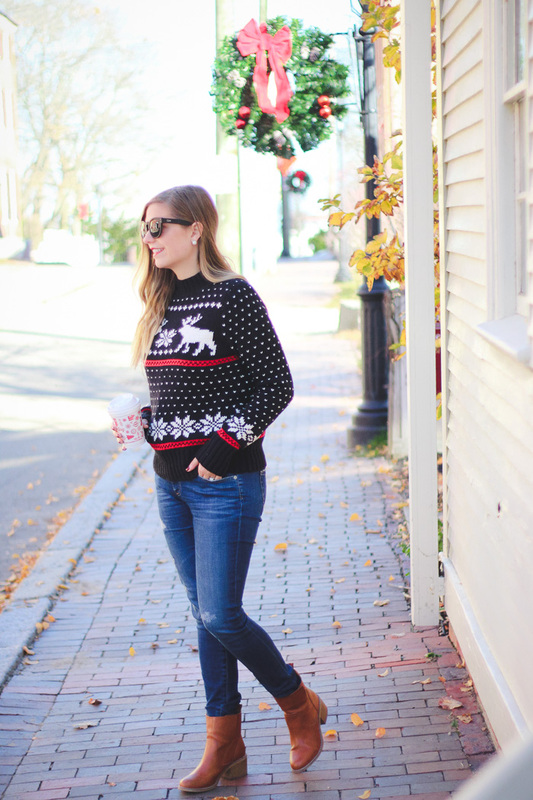 Last year I purchased one from J.Crew (see here) and even though I loved the scene on it, I never really loved the fit. The sleeves were cropped and it wasn't super cozy. So back on the hunt I went. I randomly saw another blogger had recently posted some really cute items from Abercrombie and I was blown away. I hadn't thought about the store or stepped foot in it since I was probably 15 years old. I was browsing the site and they have some really cute stuff and nothing has the super loud "Abercrombie" across ever inch like it used to. So as I'm loving everything I'm seeing, I saw this sweater. I think I added it to my cart and checked out in under a minute. I was nervous since I hadn't purchased anything for so long, so I was taking a chance on the fit and quality. Well friends, I think they did it, they created the perfect Christmas sweater, in my eyes anyway! The sweater is really thick, the sleeves are nice and long, and it's so super cozy. I also love the mock turtle neck which keeps you even warmer but isn't over powering. Because I was so blown away by the changes at Abercrombie, I decided to highlight some of my favorites from the site below! I'm definitely more of a Cyber Monday shopper than Black Friday. No waking up early, to crazy lines, and you can shop from the comfort of your couch! Gap - 50% off everything with code "CYBMON"
Madewell - 25% off everything with code "CYBERMONDAY"
J.Crew - 40% off with code "MONDAY"
J.Crew Factory - 40% most everything and free shipping with code "HAPPYSALE"
ASOS - 20% off everything with code "GOGOGO"
Kate Spade - 30% off with code "WIRED"